What a week we’ve had! 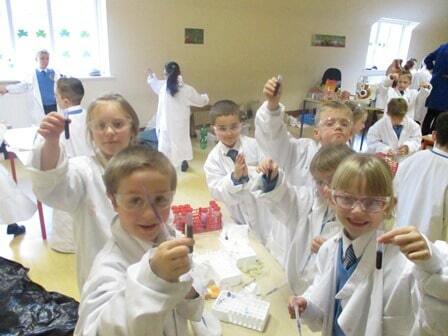 Room 8 had so much fun being scientists for Science Week. On Tuesday Dr. Dave from Maynooth university visited the very lucky children in our school. We were each given lab coats and goggles to protect our clothes and eyes. Dr. Dave told us the importance of healthy eating (makes us strong) we then experimented on lots of different foods such as bread, mushrooms, and cornflakes to see which one had energy (starch). We were amazed that the high energy food turned black after we dropped a special solution on them (iodine). We then tested drinks for protein and no surprise that milk came out on top. On Wednesday and Thursday Ms Bates introduced us to magnets! We learned so much by freely exploring magnets. We watched a video and found out that if two of the same sides of the magnet are put together they will repel each other. Did you know? the earth is one giant magnet as there is nickel and iron in the middle of the earth! How cool is that! BIG THANK YOU TO DR. DAVID FITZPATRICK AND HIS ASSISTANTS….. WE LOVE SCIENCE!